As perhaps mentioned before, I work in the admissions office of a graduate/professional school. A lot of people who have been put on the waitlist are sending in letters saying they are still very interested in attending our school. Lots of people also go off on mushy/sentimental tangents. One person actually quoted from Batman Begins: "Why do we fall? So that we can learn how to pick ourselves up." Anyway, I like Batman Begins, and I'm excited for The Dark Knight, but I'm just thinking it's kind of silly to quote from a Batman movie when you're trying to be admitted to an institution of higher learning. Now, maybe if he had created a Batman comic strip and tied it into our school, then it could have been good. But just quoting from Batman Begins and then explaining the relevance is silly. Socrates once said, "the unexamined life is not worth living." 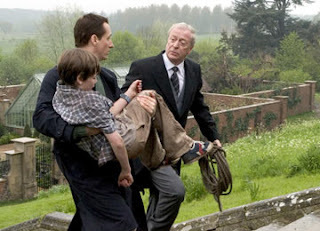 Bruce Wayne's dad once said, "Why do we fall? So that we can learn how to pick ourselves up." Foodandpantsman once said, "just stop." -Dad, why do we fall? - To learn how to pick ourselves up. And son, don't use this line when you're applying to grad school.